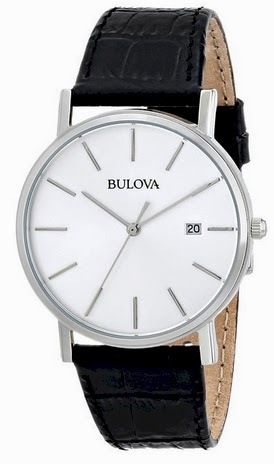 Amazon has got this beautiful, simple men's Bulova dress watch (#96B104) down to $52.00 with free Prime shipping and free returns, (great feature for gift giving; if he doesn't like it, back it goes). This is the lowest recorded Amazon price on this item. I've been watching this one for a while and this is only the second time I've seen it dip below $90 in a long time. If you are in the market for a nice-but-not-ostentatious, classy watch for your husband, father, graduate, Bar Mitzvah gift, etc. this is a great choice. Compare to $133 at Macy's (and it is over $100+ pretty much everywhere else).